I’ve been thinking off and on this BBT season about Kaley Cuoco’s performance as Penny. She’s an actress playing an actress, which wouldn’t seem to be all that difficult to do—especially since we’ve hardly ever seen her "at work," per se—but Cuoco does an especially fine job of conveying that precise balance of “eternal optimism” and “long-since given up” that typifies the aspiring Hollywood starlet. 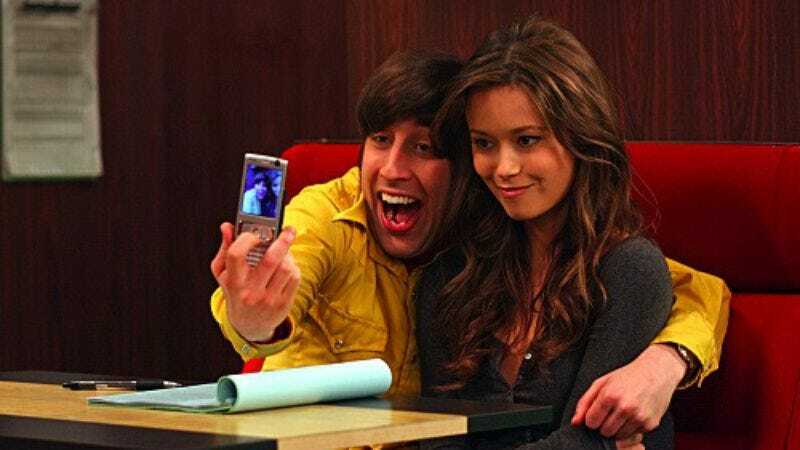 Given Cuoco’s youth—and the fact that The Big Bang Theory is her third series—I doubt that she has much personal experience with being a Penny. But she probably knows a few. Anyway, compare Cuoco’s performance with Summer Glau, who appears in “The Terminator Decoupling” as “herself.” Glau is fine, but she’s not asked to say much, and ultimately she’s less compelling than Cuoco, who holds her own in an extended phone conversation that in my opinion is the comic highlight of the season so far. One of things I loved about this episode was that for the first time since “The Lizard-Spock Expansion,” I felt like the writers spread the story evenly between the five members of the ensemble—including poor neglected Raj, who stood up for his rights to make a pass at a geek-friendly celeb, even though he couldn’t quite keep his own uncoolness from leaking out while talking with Miss Glau. When all the characters get their due, The Big Bang Theory is a lot more dynamic; it's like the difference between a five-piece rock band and one acoustic guitar-pickin' dude in a coffehouse. Eventually, Howard muscles Raj out of the way by pointing out that he’s been drinking non-alcoholic beer, not the real kind, and the smooth-talking Mr. Wolowitz attempts to rally to his own cause with his best back-up line: “I’m the small package good things come in.” Howard’s awful, awful conversation would be pretty funny played as one long scene, but it’s even funnier to cut from a bored Leonard stacking sugars on his Styrofoam tea-cup to a tone-deaf Howard in the middle of describing a dream in which he tears Glau’s ankles off and she turns into a loaf of pumpernickel. (The capper? “I like sausage on pumpernickel.” The capper on the capper? According to Howard, pumpernickel means “fart goblin.”) When I talk about the well-balanced structure of “The Terminator Decoupling,” I’m thinking about the way—in a confined space, mind you—the writers, director and cast keep a lot of balls in the air, and keep the audience waiting on pins and needles for one to drop. I laughed at pretty much every part of that conversation, but especially at the perfect timing of Penny switching over to another call for a few seconds and then coming back to Sheldon saying, “Okay. Step Four.” Such a well-played, classic comic bit, expertly handled by Jim Parsons and Kaley Cuoco. Let’s see Summer Glau top that. -I found Sheldon’s dilemma over whether to hack the TiVo or erase the first season of BSG compelling, but a little irrational. Don’t they have the DVD set? -The reason Sheldon can’t go to The Apple Store? He’s using a barcode system to scan the clothes in his suitcase into his computer. Of course. -Hey, they mentioned Howard dating Leslie! Something else this episode got right. -Sheldon has an excellent point about Skynet sending Terminators who look like actors who’ve played Terminators. It would be a foolproof plot. -When Sheldon calls Penny, she’s actually in the middle of conducting acting-related business, trying to drum up an audience for a production of The Diary Of Anne Frank that takes place above a bowling alley. The director uses the sound of falling pins to stand in for Nazi artillery. -Leonard’s reading A Wrinkle In Time. Maybe I’ve been watching too much Lost but I instinctively want to dig out my Madeline L’Engle books and hunt for clues.